Total Chaos reminds us that the godfather of punk is not an idiot. Iggy Pop is the last man standing. Everybody knows that. Thank god he’s still lucid. 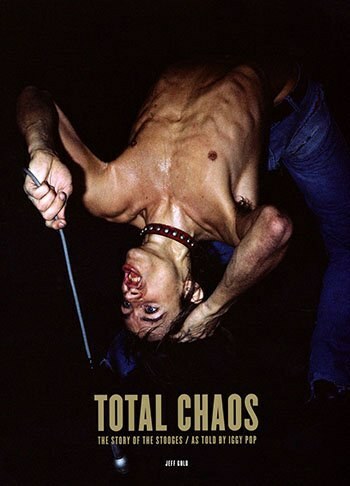 Of all the uncomprehending dismissal we have laid at his feet over this past half-century, perhaps the best way I can convince you to read Total Chaos is to simply state first and foremost: Iggy Pop is not stupid. Off stage, he's a genuinely nice guy, as much as somebody like Dave Grohl or Alice Cooper are nice guys. It’s easy to mistake a pleasant attitude as being compensation for lack of intellectual ability. Because of the way some rock stars act on stage, we conflate their ability to get raucous with some perceived necessity of being vacuous. It seems like only an animal could crawl around on broken glass and slather peanut butter on its chest. It seems like only an animal could let itself fall into a five-year junkie rabbit-hole strewing a decade of relapses in its wake. To that, I say: only a genius could have invented the stage dive. Only a genius could stride across the outstretched hands of his audience, cruising across the surface of their love for him. I mean, this is a guy who compared his grandmother to performance artist Marina Abramovic. Jim Osterberg grew up under the leftist umbrella of Ann Arbor; he was on the high school debate team. He can read a book, OK? When he briefly attended the University of Michigan, he studied Social Anthropology and particularly enjoyed books about tribalism in non-Western culture. He says he lives in his head. That means there must be a lot of stuff in his head. He doesn’t know how much of his live performance is intentionality and how much of it is giving himself over in the moment. He just wanted to serve his band, which too often meant being their dad. He just wanted to get a reaction from the audience, which too often meant being their nightmare. He’s a committee artiste with nine lives to give. Iggy Pop understands that a glam persona is a problem. He understands that drug abuse has a high price. He cops to a cornucopia of misdeeds and rarely criticizes anyone else. He's willing to discuss dollar amounts that he was paid and that he owes. He's aware of the sins of each member of the Stooges and he forgives them all. At the end of many stories where accounts are conflicted, he laughs lightly and tacks on “and that’s ok” for a conclusion. It’s a very accountable, down-to-earth perspective, sort of parallel to Chrissie Hynde’s Reckless: My Life as a Pretender. Iggy Pop can look himself in the eye all day -- and he never has a problem looking an audience in the eye. So Jeff Gold gets a big thumbs up for using an interview format to make this book. Iggy Pop remembers a sick amount of detail, but he appreciates some prodding. He patiently goes where the artifacts take him because Total Chaos is equally a beautiful coffee table book, filled with exclusive flotsam and jetsam. A couple of major Iggy Pop memorabilia collectors pooled their stash of concert posters, photographs, letters and other artifacts, then put them in chronological order in front of the man himself. Iggy Pop is opening a time capsule, sometimes referring directly to these precious and rare materials and sometimes just riffing on the moments that orbit them. The result is an engrossing, clear-eyed reflection on his legacy and the personalities that made it possible. It’s not a tell-all because Iggy never had any secrets in the first place. But this is a man’s personal feelings about his life’s work conveyed to us in his words, and in closing out 2016, a year when important music legends were dropping like flies, it resonates with exactly the brightness music lovers need right now. He owns all his choices and their consequences, for better and for worse. In the final analysis, the Stooges were simply three decades ahead of everyone else. People love that Nirvana photo where they’re all in the cornfield. Iggy did that in 1968. Cobain called him the total idol. After 300 pages of looking at artifacts with Iggy, Gold sort of blows it by including a few slices from big names who appreciate the legacy of the Stooges. Dave Grohl is in there with a great bit about being 19, still in Scream, and lucking into playing drums for Iggy -- once. Joan Jett plays it so humble against the shine of Iggy’s influence that she almost doesn’t say much of anything concrete beyond a description of the Rodney’s English Disco scene in L.A. Johnny Marr delivers an abstractly poetic half-page. Jack White gets to have his two cents for the love of Detroit. The rest of the back section is unnecessary. Josh Homme’s inclusion simply feels weird, as we have no other band members weighing in on what it was like to work with Iggy. Granted, Homme is a generation younger, so Iggy Pop is both influencer and colleague at once, but his interview revealed nothing about Iggy’s nature that readers cannot glean themselves right from Iggy’s mouth. Ben Blackwell has a memoirish essay that reinforces White’s Michigan thread in a more detailed way, but the more detailed way ends up feeling very tedious by comparison. Then there are some reprints of music magazine snippets curated to talk about Iggy Pop’s various phases and legacy, and a final interview focusing on his fashion sense that should’ve instead been integrated as fodder for new questions. So the last 20 or 30 pages of the book are poorly chosen, but what a goldmine of priceless nuggets is to be had from getting Iggy Pop in his own words. It’s a geyser of Midwestern syntax and unflinching self-evaluation. The way he keeps saying “all of the sudden” or “all the sudden” instead of “all of a sudden”. The way he says the Boss is a “class guy” instead of a “classy guy”. A hundred thousand “you know” phrases are dropped in as commas. He keeps saying he tells it like it is before he criticizes either his animal or his genius natures. This book is launching in the same window as Jim Jarmusch’s documentary, Gimme Danger. Iggy also collaborated with -- in fact, instigated -- that production. It begins with the band imploding in 1973, whereas this book begins at the beginning. Jarmusch is likewise peddling exclusive archival material and the true fan angle, plus he chose to interview the immediate band family. I have yet to see the film, but my guess is that the book and the film will be differently and equally valuable in large part simply because Iggy Pop doesn’t do anything canned and repetitive. He doesn’t go in for that Warholian copy machine approach just to cash in. Iggy Pop is a capable, confident narrator of his authentically weird life. He hasn’t actually been clouded by total chaos, which is why Total Chaos is well worth reading.